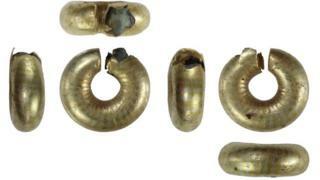 A gold-plated Bronze Age ring thought to have been worn on the ears or nose has been described as a "notable" find. The ring, likely to have been used as a "personal adornment", was declared treasure by a coroner. Julie Shoemark, of Norfolk County Council, said it was "significant" in that it added to "our understanding of Norfolk's history". The artefact is classed as a "hair-ring" or "ring-money" but experts believe it was a personal adornment. "I would say the ring is quite notable," said Ms Shoemark, a finds liaison officer. "These are a peculiar class of object which are still not fully understood. "Approximately 170 have been reported as metal detecting finds across England and Wales, nine of which are from Norfolk, with others known from excavation." Part of its core has corroded over time but Ms Shoemark said that at the time it was made, the item "would have appeared to the viewer as being of solid gold".